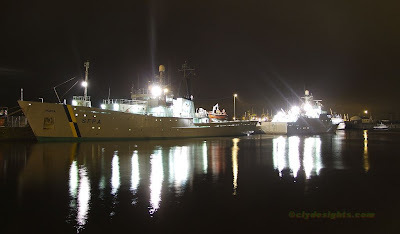 Two of the Scottish Fisheries Protection Agency's fleet are berthed in the James Watt Dock, Greenock, for Christmas. NORNA and MINNA are seen sharing the SFPA berth last night, with ALI CAT berthed around the corner. ClydeSights would like to extend Season's Greetings and Best Wishes to all for the festive period. Merry Christmas and all the very best to you too John. Merry Christmas and thank you for all the great pix through out the year and look forward to many more in the coming year. All the very best to you too, but most of all, thanks for maintaining an absolutely excellent and informative site. It has given me much pleasure since last February when I discovered it. Merry Christmas. Great site as I live by the Clyde. Really informative. Makes me want to get back and started on mine again!! Best wishes. Compliments of the Season from me too! Cheers and many thanks for a fantastic blog John.